David Lawlor, the author of the infinitely readable TAN and THE GOLDEN GRAVE here tells us a wonderful tale from our history. If you haven’t read Lawlor’s books, check them out. You can find my reviews of both books right here on this very blog. You may not think the words in the headline above belong in the same sentence, but history throws up some intriguing links sometimes. This one caught my eye a while back, but I think now is a fitting time to share it. We’re fast approaching the 138th anniversary of, arguably, America’s most ignominious military defeat. It was on June 25, 1876, that a bunch of ‘savages’ under Chief Sitting Bull aninhilated the command of the charismatic, vainglorious Colonel George Armstrong Custer at the Battle of Little Bighorn. 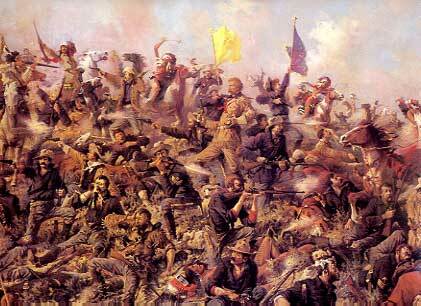 ‘Custer’s Last Stand’, as it became known in the media, was portrayed as a noble fight in which over 200 men lost their lives fighting a force of approximately 2,000 Indian warriors.